There aren't many companies invested in smartwatches quite the way Fossil is. Last year, it released over 100 different smartwatches, hybrids and wearables, and it's looking to expand that range to more than 300 in 2017. While it has plenty of brands to play with – like Diesel, Michael Kors and Misfit – it's also been bold with its own name brand. Enter the Fossil Q Venture and Explorist, the company's latest Android Wear smartwatches. They also happen to sport full screens. That's right, no more flat tires. But that's not all these watches sport. Here's a guide to everything you need to know about these two beauties, which are now available to pre-order with shipping in late Septmeber. The flat tire is a thing of the past. That's the big thing you notice when looking at the new Venture and Explorist models – the display goes all the way down to the bottom, forming a perfect circle. The other thing you'll notice is that both the Venture and Explorist have been slimmed down considerably. Last year's Q Wander measured in with a 45mm face and 13.5mm thickness. The comparable Venture, however, comes in with a 42mm face and 11mm thickness. In our Fossil Q Venture hands-on review, we found the new slimmed down size to be a real improvement. On the men's side, the Explorist checks in with a 44mm case and 12mm thickness, which is better than the Q Marshall's 45mm case and 14mm thickness. So while both watches are still chunky, they're much more svelte than last year's models. They're also slightly more curvy, and are a much better fit for smaller wrists. Of course, you'll be able to get the watches in a variety of styles. The Venture is available in eight colours including rose gold stainless steel and stainless steel with multiple band options, like a rose gold link bracelet and tan leather. The Explorist is available in five colours including stainless steel and rose gold stainless steel, but also comes with a smoke grey variant. Bands include navy and brown leathers and a smoke link bracelet. Finally, you can expect that display to get a bump up in resolution. While we don't fully know how large of an upgrade the new displays will be, Fossil told us at Baselworld 2017 that they had been improved over last year's mediocre displays. There's no GPS or heart rate tracking here, as these are watches that are focused on style. We do know they're powered by a Qualcomm Snapdragon 2100 and feature 4GB of storage and 512MB of RAM. As previously mentioned, the displays will have a higher resolution and better contrast. You'll also be able to swap out the watch bands for something else should you want to mix and match, for fashion's sake. There's also various fitness tracking and integration with Google Fit, UA Record and MyFitnessPal. On the software front, the big new things include a game exclusive to the Fossil Q's inspired by vintage arcade games, along with some branded micro-apps. These are micro applications that'll do specific things, though we still don't have too much detail on what kind of things they'll be able to do. What we do know is that there'll be four exclusive Fossil watch faces and – of course – ways to customise your watch face with complications and the like. While that isn't exactly a surprise, it's unclear if these are new watch faces or faces already available on other Fossil-branded watches. 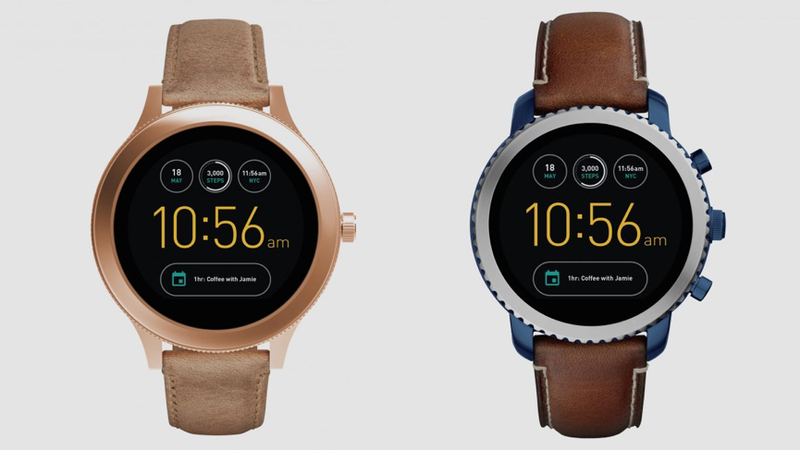 All of the Fossil Q Venture and Explorist models are now available to buy on Fossil's website where they are referred to as "Gen 3 smartwatch". It looks like they will ship around 24 September and prices range from $275 to $315.